I am Coxy, hire me today! 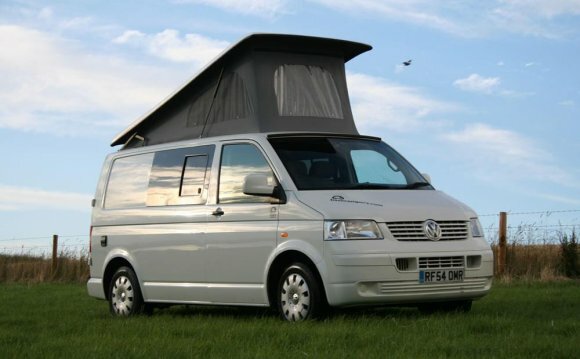 Following on from the first version of the VW T4 Transporter Villa model in circa 1993 Richard Holdsworth Conversions released a new version called the Holdsworth Villa XL Camper. The interior layout is similar in design to the earlier VW T4 Holdsworth Villa but with updated upholstery and improved design and specification. The interior has cupboards along the side behind the drivers seat and the rear seat converts into a 3/4 width double bed. This Holdworth conversion is absolutely first class!! The van is a superb modern camper with a reimo pop top that provides lots of head room whilst you are cooking, washing up or just enjoying your day. By night the reimo pop top space has a large comfortable double bed. Ruby is a classic VW RHD bay window camper, she was born in 1976 and is red and white with a new 1.6 litre unleaded petrol engine. Ruby is 4 seater fully restored with all mod cons and looking beautiful for her age and eager to explore. Recently converted 2 berth motorhome with swivel front seat chairs, rock and roll bed and toilet in the back of the van. Price is £50 per night plus insurance which either we or you can provide depending on where the best quote can be provided. Meet Ferris, our Fiat Motorhome. He is a 6 -berth family camper available for hire, not as pretty as a bay window but a fantastic camping vehicle. Pickle, our extra spacious Volkswagen T5 Campervan is perfect for a getaway where you dont require dining. It doesn't contain cooking equipment but does have a fantastic chest fridge.